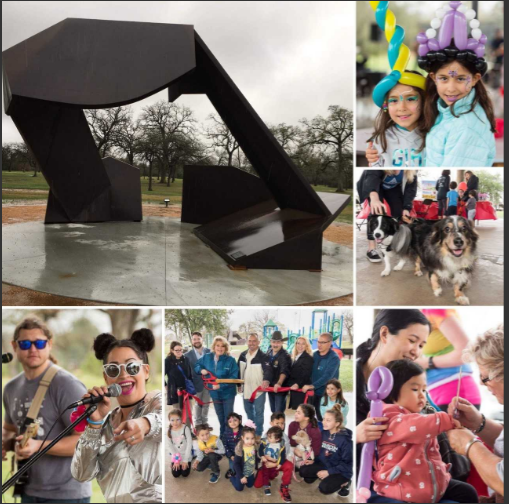 February 26, 2018 -- Valued at more than $350,000, the monumental sculpture High Plains Drifter by Peter Reginato was unveiled Sunday at its new home in Agnes Moffitt Park, 10625 Hammerly Blvd. in northwest Houston, part of City Council District A represented by Council Member Brenda Stardig. An evaluation of the city's Civic Art Program initiated by Mayor Sylvester Turner in 2016 pinpointed districts that lacked civic art. The evaluation led to the sculpture being relocated away from downtown. "Every part of the city should be able to enjoy civic art right where people live," the mayor said. In 1999, the City of Houston established an ordinance mandating that 1.75% of qualified Capital Improvement Project monies be set aside for civic art. The program is managed by the Mayor's Office of Cultural Affairs. For more information about the City’s Cultural Programs go to www.houstontx.gov/culturalaffairs or follow the Mayor’s Office of Cultural Affairs on Facebook @HoustonMOCA.